On Friday 22 August we held a fun packed team building day for a group of 20 corporate investors in Central London. Their day commenced by boarding a private pod on the London Eye where a sumptuous champagne breakfast took place followed by a briefing for their 2 hour Cab Clue Trail to follow! 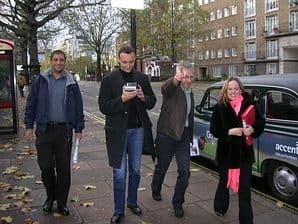 Once all 4 teams disembarked the London Eye armed with their question packs and Polaroid cameras, each team got into their own private cab and the treasure hunt began. After solving the riddles to work out all four destinations, decrypting clues whilst taking photos for bonus points, all the teams had to reach their final destination by 13:20 or points were deducted. As cabs arrived at their secret end destination – Blackfriars Pier – teams seemed to have really enjoyed the Trail and were excited at the prospect of spending time on their own private chartered yacht, The Rum Jungle for a relaxing afternoon cruise along the Thames. Guests had a champagne reception upon arrival, which was followed by a superb fork buffet lunch and a selection of delicious puddings. I would like to say a huge thank you to all the staff at The Rum Jungle for all their help and excellent service provided. Once all the papers had been marked the winning team was presented with their trophy and chocolate trophy, supplied by the client to celebrate their victory. Having spoken to the client all guests thoroughly enjoyed their day and it was a pleasure to spend the day with them. For more info on our Cab Clue Trail, please contact us.